In this era of activist state governance, the term “laboratories of democracy” has been used to describe the rapid policy changes occurring as statehouses have shifted in control over the last few years. Almost exclusively, these have been conservative changes, as crusading right-wing majorities have tackled long agendas: slashing spending, privatizing everything from education to Medicaid, restricting access to the polls, busting public-sector unions, hindering access to abortion and birth control, and, of course, dramatically cutting taxes. A left-wing laboratory of democracy is not something that anyone has read about lately. Yet that’s what Dan Malloy (for whom, full disclosure, I worked as an intern), the first Democratic governor of Connecticut in 20 years, is engineering. His project of “shared sacrifice” tax hikes across multiple income brackets, in addition to numerous socially-liberal legislative actions in the erstwhile Land of Steady Habits, is basically without peer. It invites two questions: is Malloy’s (and the legislature’s) approach actually resulting in good policy? 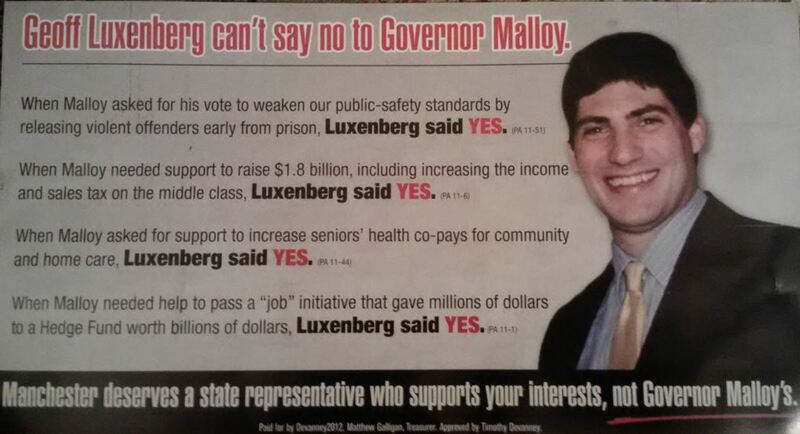 And, regardless of the answer to that, will it be rewarded by voters when Malloy is up for reelection in 2014? Here is an overview of the biggest changes Connecticut has undertaken in the last few years. Some have been easy, popular reforms. Others, not so much. That big tax hike. 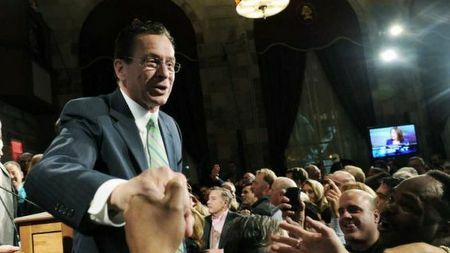 After winning the governor’s office by just 6,400 votes in 2010, Malloy faced the largest per-capita deficit in the country, roughly $3.5 billion. A month into his term, he introduced new tax brackets spread across income levels and signed an increase that would make up for nearly half of that budget gap—the largest hike, by far, since the income tax was implemented in 1991. Sales taxes also went up, and were expanded to more businesses; the income tax hike was broad and relatively shallow rather than narrow and deep on the wealthy. Among most governors of either party, raising income taxes was an unheard-of step in 2011. Cuts alone were, and remain, en vogue as the way to balance budgets. But Malloy insisted on the shared sacrifice approach, earning him points for political courage—and some unpleasant town-hall meetings full of a disgruntled voter base. Negotiating with state employees. Under pressure from both the budget and the labor groups who had supported him during the election (and his own Democratic principles), Malloy held drawn-out negotiations with state employee unions and came to an eventual compromise. The decision earned him the heightened ire of voters already pissed off about the tax increase—the perception was that because he did not marshal a Chris Christie/Scott Walker crackdown, he was a union lapdog. Yet he extracted $1.6 billion in givebacks—leaving him as “Corporate Dan” in the eyes of equally-pissed-off labor negotiators and rank-and-file members. By taking the middle road, Malloy invited a political lose-lose, but managed to yank the pension fund into shape for the first time in decades while preserving union power. Sunday sales and decriminalization. Over the absurd protests of some religious figures and confused liquor store owners who thought it would be bad for business, the legislature overwhelmingly repealed laws that had made Connecticut the second-to-last state to ban Sunday sales of alcohol. A smaller but still bipartisan majority also voted to decriminalize possession of small amounts of marijuana. Abolishing the death penalty. Malloy managed to get elected despite opposing the death penalty in the wake of one of the most astonishingly awful and high-profile crimes in the state’s history, the Cheshire home invasion murders, whose perpetrators were on trial as the election was happening. The legislature passed, and Malloy signed, the repeal after the Cheshire duo was sentenced to death, managing to do so by making the new law not retroactive to those already on death row. 62% supported the death penalty around the time the law was passed in early 2012. Comprehensive education reform. Malloy’s far-reaching plan to overhaul education included everything from dramatically increasing funding for early-childhood education to closing the achievement gap, which was the nation’s worst by some metrics, to reforming teacher tenure. In that last item lay the rub (and tying teacher evaluation to standardized test scores didn’t help). Though it had the formal endorsement of the unions, many teachers weren’t thrilled with the package that eventually became law, and it invited unfavorable comparisons with Christie and other teacher’s-union-bashing governors. There is a legitimate question as to whether teachers will come home to Malloy in 2014 over this, but union support—and the bill’s unanimous passage!—counts for a lot in comparison to states governed by Republicans and even other Democrats. Education reform with a progressive bent is rare indeed, and teachers who are upset with the situation in Connecticut should have a chat with their colleagues in New York or Wisconsin sometime. Early prison release. 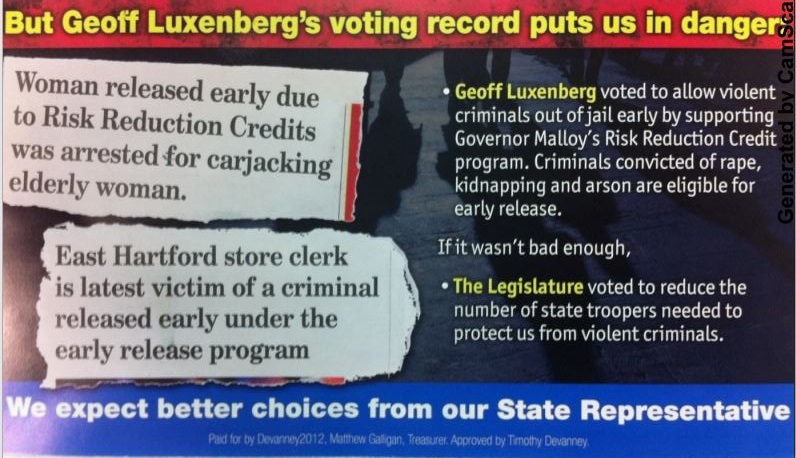 What Malloy and the Democrats in the legislature passed into law as the Risk Reduction Earned Credit program quickly became known to political opponents as “early release” and as a lightning-rod issue in the legislative midterms. The program awards “credits” to prison inmates for good behavior and participation in courses that ease reintegration into society. The purpose is threefold: save money, reduce recidivism, and give greater control to prison administrators in order to create more humane conditions but also to flag high-risk inmates to have parole delayed. So it is a law-and-order program, too; violent offenders are serving longer now than they did under the old system. But despite the broadening elite consensus that prison reform is necessary (even Grover Norquist is onboard that train), actual policies to address it are uncharted territory in much of the country, and as a pillar of progressive experimenting in Connecticut, it became ripe for demagoguery. Expanding voting rights. Before Malloy was governor, there was no same-day registration, no early voting, no “no-excuse” absentee ballots, widespread ballot access problems, and middling-to-lousy turnout. The legislature passed laws to rectify this, and though they have not yet taken full effect (some of the changes, like early voting, require a referendum), it represents perhaps the clearest contrast to conservative laboratories of democracy, which have been very enthusiastic about reducing enfranchisement of voters. Driver’s licenses for illegal immigrants. This is an issue some might remember from Eliot Spitzer’s governorship, when it turned into an embarrassing disaster (relatively speaking) for not only him but also a certain home-state senator. The rationale in Connecticut was the same as in New York: if undocumented immigrants are driving anyway, it’s a matter of public safety that they are licensed. Malloy backed this too, even though it, like the death penalty, was abridge too far for many voters, with 65% against it. Transgender rights. A bill to prevent discrimination against transgendered people was backed by Malloy and Democrats in the legislature, while Republicans, some of whom supported gay marriage and civil unions before it, uniformly opposed it because of a provision to allow use of public bathrooms based on gender identity. Gun control. After Connecticut suffered the most horrific school shooting in the nation’s history in the Newtown massacre, it enacted the country’s strictest gun laws, requiring universal background checks and banning high-capacity magazines and certain types of weapons. This time, bipartisan support was achieved, and popular support ran deep. But gun enthusiasts filed a lawsuit to invalidate the law for procedural reasons, and Connecticut-based gun manufacturers groused about leaving the state (prompting a visit from Gov. Rick Perry of Texas who asked them to c’mon down). Though it generated controversy at the fringes, this is an issue that is similar to education reform in that it’s an overall win for both the state and for Malloy politically; tellingly, one of his potential opponents, state Sen. John McKinney, who represents Newtown, voted for the bill, while Tom Foley, who wants to run again, refuses to comment on it. It bodes well for Malloy’s reelection chances that in the 2012 legislative elections, Democrats didn’t lose a single seat. The GOP strategy was to tie legislators to Malloy and hammer the controversial issues, but this lacked purchase among an electorate still concerned chiefly with the economy. But will the progressive experiment continue in Connecticut? It’s an interesting question, and remains an open one. What’s more interesting is that, in this day and age, it’s happening at all. Update: This post previously failed to note that the author had worked as an intern for Governor Malloy. The text has been corrected.